We’ve already been treated to Nintendo eShop releases of Aero Porter and Liberation Maiden from LEVEL-5’s Guild01, yet it is the latest arrival from the collaborative compilation that proves to be the most noteworthy. 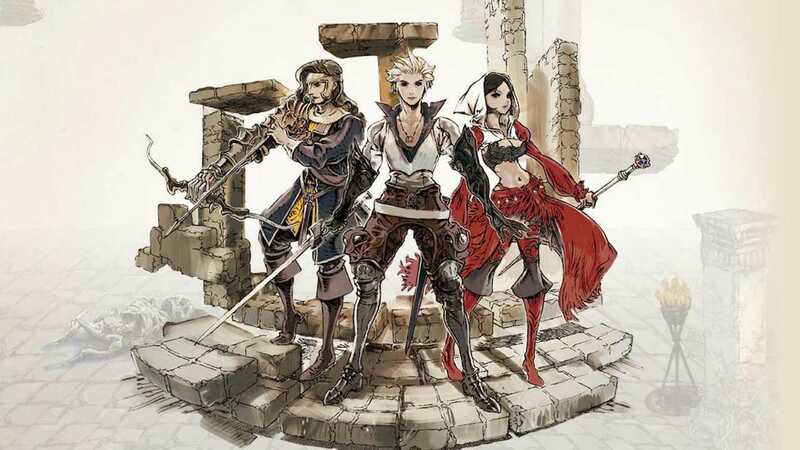 Bringing his knowledge of crafting celebrated role-playing classics such as Vagrant Story and Final Fantasy Tactics, Yasumi Matsuno’s most recent project, Crimson Shroud, draws upon the origins of the genre. This reflects back to the days of table-top RPGs, with Dungeons & Dragons perhaps being familiar to most. The chosen game-master weaves their own tale for the other players as they navigate a dungeon. Choices must be made by the player, as well as battling foes that line the dungeon’s dark corridors, rolling dice to determine their success. Matsuno draws upon such ideals within Crimson Shroud, so much so that characters and enemies are represented by figurines. You’re regularly granted choices, an example being to either attack or sneak past a group of enemies, with a dice roll on the touchscreen required to see if you’d managed to do the former. This is also a heavily text-laden adventure, lengthy paragraphs filling the screen to present both narrative and dialogue to the player. I’m sure that this would probably be of concern to some, but it suits this downloadable gem to a tee. Crimson Shroud‘s story tells of a renowned king who once ruled with twelve loyal ministers, known as the “Chosen of the Solis.” His kingdom was prosperous, and he one day gave a palace to his queen as a gift. Yet the king soon becomes arrogant of his accomplishments, the people he once united soon leaving him to join the barbarian tribes. War ravaged the lands, and the king prayed to God for peace. His prayers were heard, but not by God. The Devil appeared from the Dark Lands and taught the king how to cast magic in exchange for his mortal soul. Wielding his newfound power, he took to the defence of his kingdom laying waste to his enemies in a single day. That night, the Devil came and took the lives of the king and his clan, carrying their souls into the Dark Lands. All that remained within the world of such tragedy was magic, yet such a story has been decried as being simply legend. The location of the tale, The Palace of the Rahab, is real, however, with the party of adventurers that you control having been sent to recover a magical artefact known as the Crimson Shroud. This tight-knit group consists of renowned ‘Chaser’ Giaque, marksman Lippi, and Frea, a nomadic Qish with an affinity for gifts and a deep knowledge of magic. Surprisingly for a role-playing game, there are no character levels, with your party’s basic statistics remaining the same throughout the entirety of the game. Yet with increasingly difficult enemies, it becomes important for you to scour for better weapons, armour and gear that do grant enhancement to your character’s stats. Combat is a turn-based affair, the players choosing between standard commands that include Attack, Magic, Items and Skills. Some action choices will require you to roll dice across the lower screen to see the strength of their effects, with combo chains through using a series of differing elemental attacks rewarding you with additional dice that can be used to further heighten your score. There are eight elements within the game – Air, Earth, Lightning, Water, Fire, Ice, Light and Dark – and you must use each individual within the chain to reap such bonuses. What complicates things further is that certain elements ‘trump’ each other, the game explaining that air trumps earth trumps lightning trumps water trumps fire trumps ice trumps air if you pardon the rather lengthy sentence. Also light and dark may trump each other. Combo chains can have as many as six links, with players gaining additional damage and other bonuses after the second link. The battles you face can range in orientation as well, with surprise attacks and ambushes seeing either your party of foes put at an immediate disadvantage being unable to attack for a number of turns. Once you’ve neutralised your foes, you are awarded barter points that are immediately allocated to spoils that you may gather from their decomposing corpses. This initially sees you walk off with a majority, but will later see you have to carefully spend your points – debating whether to leave a rare item or equipment behind. A basic crafting system also comes into play, with the player using Pure Azoth to meld equipment. You can either meld identical pieces together to create a stronger version of such item, or embue equipment with spells cast through the use of a spellbook. Where the game perhaps suffers is that the pacing can feel slow, and the player is at times left at a loss of knowing exactly where to go next. Yet these are minor grievances in an otherwise spectacular game. Crimson Shroud is a wondrously charming addition to the Nintendo eShop, that beautifully recaptures the origins of one of the gaming industry’s most adored genres. Role-playing game fans will most certainly find much to enjoy here.